﻿ Chicago Hispanic Newspaper, Lawndale News, Hispanic Bilingual Newspapers, Su Noticiero Bilingue » The Lone Wolf? April 25, 2019 4:41 pm You are here:Home Commentary The Lone Wolf? Posted by Editor on October 20, 2011 in Commentary | Comments Off on The Lone Wolf? Anders Behring Breivig, the man who murdered 77 people in Norway, will soon go to trial for his mass killings. If convicted he could face life imprisonment. His crime is the worst act of mass murder committed in Norway since the Nazi occupation of Norway from 1940-1945. Many people believe that he acted alone. But was he really alone? 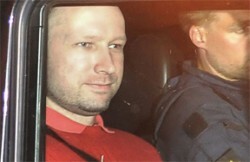 On information found in Breivig’s manifesto that he published online, Norwegian police believe that he may have had contacts outside of Norway who may have helped him in his endeavor to carry out his attack. On information provided by the Norwegian police, the Polish authorities began to investigate 19 suspected followers of an extreme rightwing group. After gathering evidence of further plots to cause violence, the Polish police moved in and arrested the 19 in question. The Polish police found chemicals, metal parts and finished bombs that could have been used to carry out attacks. So far these people do not seem to have a solid connection with Breivig. But was it just coincidence that Breivig managed to obtain the necessary materials to make a bomb he used in Norway’s capital Oslo? And from what source? Could these people have been the connection? More evidence will be needed to be sure that these people have any real connection to Breivig. What this example illustrates is the shadowy nature of how extreme rightists and neo-fascist elements operate. They operate on low-key, almost invisible connections via the Internet or in informal sessions with individuals from one country to the next. This is done to make it hard to follow what these groups may be doing, and what acts if any may be carried out. There is no question that 99 times out of 100 these right wing extremists are planning things that are legal. But suppose they are planning something that may be violent in the extreme? And there is the problem. Prosecutors in Norway and Poland must now try to find a link between these individuals and what they knew and their connection to Breivig. Is there a link? The burden of proof is on the prosecutors in both countries. Was Breivig the lone wolf, or was he part of a greater loose conspiracy where he was part of a web by certain individuals and groups to commit acts of violence and terror in more than one country? We still do not know the answer to this. One thing is clear however—extremist rightist groups are connecting and operating in coordination with each other from one European country to another. With the European Union encompassing so many countries with no checkpoints, this has become a bonanza for extremists to cross whole countries in Europe. We know that such people hold extreme anti-immigrant, racist ideology and will violently carry it out no matter where they may be. As frightening as this is, the next scary question is are these same groups already becoming operational in the United States and the Americas?